At the start of your turn, move a random friendly creature to this lane. Dance Partner is a common Intelligence creature card. 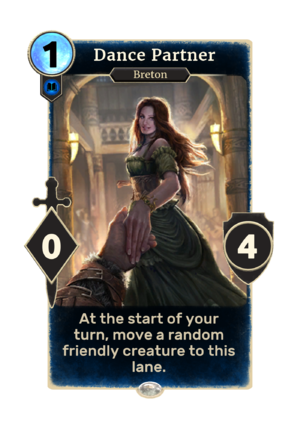 It is not obtainable as part of your collection, but instead appears during NPC matches such as the "Arenthil Wethrin's House" match in The Fall of the Dark Brotherhood. "Try to keep up, darling!" This page was last modified on 27 February 2019, at 00:50.